I wrote a bit about wrong-airport landings last month after the Dreamlifter made an unscheduled detour to a small civilian airport in Wichita. They say things happen in threes, so it wasn’t surprising that the faux pas keeps recurring. Next was a Southwest Airlines flight — which really could have ended badly as they put their 737 down on a far shorter runway (3,738 feet) than any I’ve seen a Boeing airliner utilize. Speaking of landing distance, for most Part 91 pilots, as long as you can stop on the available runway without bending anything, you’re good to go from a legal standpoint. Airlines and charter operators, on the other hand, are required to have a significant safety margin on their landing runways. 14 CFR 121.195(b) dictates that a full stop landing be possible within 60 percent of the effective length of the runway. To put that into perspective, John Wayne Airport’s runway 19R is considered to be one of the shortest used by major airlines on a regular basis. That runway is 5,700 feet long, so landing on a 3,700 foot strip — at night, no less — must have been exciting for all concerned. The third (and hopefully last one) for a while was a Boeing 787 which narrowly managed to avert landing at the wrong field, but only with the help of an alert air traffic controller. I related the story of my own Wichita experience in order to explain how easily one airport can be mistaken for another. But I can take it a step further: I once witnessed a very memorable wrong-airport landing. It was 2008, and I was in Arizona for an aerobatic contest being held at the Marana Regional Airport (which also happens to be where all those Starships are awaiting their final fate). Ironically, a number of FAA inspectors had been on-site just 24 hours earlier, ramp checking every pilot and aircraft as they arrived for the competition. Too bad they didn’t show up the next day, because they missed quite a show. At Marana, the aerobatic box is located two miles southeast of the field, and at the time the incident occurred the contest was in full swing. These events require a large contingent of volunteers to operate, so traditionally competitors will help with contest duties when their category is not flying. I was sitting just outside the aerobatic box, judging a combined group of Advanced power and glider pilots when I overheard someone at the chief judge’s table calling out a traffic threat. Despite waivers, NOTAMs, ATIS broadcasts, and other information about the contest’s presence, it’s not unheard of for a non-participating aircraft to wander through the aerobatic box. The chief judge had just cleared a new competitor into the box, so he immediately called back and told him to return to the holding area and keep an eye out for the encroaching airplane. I scanned the sky and visually acquired a miniscule speck in the air south of the box. I figured it was a small general aviation aircraft of some sort, but as time passed and the tiny dot grew in size, it became apparent that this was no Bonanza or Skyhawk. We all watched in amazement as a Boeing 757 materialized in all it’s splendor. The landing gear extended and it flew a beautiful descending left turn right through the aerobatic box and dipped below our horizon. “Well that was weird”, I thought. But hey, this was my first time at Marana. Perhaps there was some sort of charter flight coming in, or the airplane needed to divert for a medical emergency or mechanical problem. The judging line maintains radio contact with the airport’s traffic frequency as well as the contest volunteers at the airport via a separate set of walkie-talkies, so we heard the sound of silence over the CTAF as this happened. I was later told that the Air Force Academy cadets, who had come out from Colorado Springs to compete in various glider categories, were on the runway getting a TG-10C glider (a military version of the Blanik L-13AC) hooked up to a tow plane when it became clear that the 757 planned on using that same piece of pavement. The cadets scrambled, clearing the runway in record time just as the Boeing touched down smoothly on runway 30, oblivious to everything going on around it. Thanks to the radios, we were able to follow the action from the judging line even though we couldn’t see the airport from our location. It must have been shortly after they turned off onto a taxiway that the flight crew realized something wasn’t right, because the 757 stopped on the taxiway and just sat there. Marana’s airport manager tried to raise them on the airport’s frequency, 123.0 MHz, but had no luck. For what seemed like an eternity, there’s was nothing to hear but the sound of the Boeing’s two engines idling. Were their radios out, we wondered? Its main purpose is to act as a “boneyard” for civilian commercial aircraft. Old airplanes are stored there with the hope that the dry desert climate will mitigate any form of corrosion in case the aircraft is pressed into service in the future. It is the largest commercial aircraft storage and heavy maintenance facility in the world. Even so, many aircraft which are brought there wind up being scrapped. 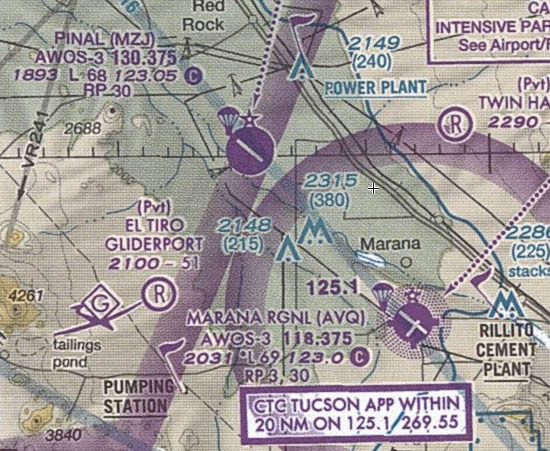 Pinal and Marana are eight miles apart and share the same 12/30 runway orientation. The 757 was devoid of passengers and cargo; it was being ferried to Pinal for long-term storage after the Mexican airline which operated it declared bankruptcy. Since Pinal has no instrument approach procedures, the pilots had to make a visual approach into the airfield and simply fixated on Marana once they saw it. Note the similarity between Pinal and Marana in terms of location, runway orientation, and relative size. Once the airport manager established radio contact with the crew, he didn’t want to let them move since he was concerned about the weight bearing capacity of the taxiways. However, the pilots gave him their current weight and were allowed to proceed. So they taxied back to runway 30 and just took off, presumably landing at Pinal a couple of minutes later. That was the last I ever heard about that incident, but I’ve often wondered what happened to the pilots. Was the FAA notified? Was there an investigation? Did the airline know? And because they were in the process of liquidation, would it have mattered anyway? I suppose it’s all water under the bridge now. What makes this incident a little different from the others I discussed above is that it took place in broad daylight instead of at night. You’d think the pilots would have noticed the lack of a boneyard at Marana, but if it was their first time going into Pinal, perhaps it wouldn’t have been missed. When multiple airports exist in the same geographic area, they tend to have similar runway orientations because the prevailing winds are more-or-less the same. As I was writing this, AVweb posted a story about an Associated Press report on this very subject. Using NASA’s Aviation Safety Reporting System, along with news accounts and reports sent to other federal agencies, the AP tallied 35 landings and 115 approaches or aborted landing attempts at wrong airports by commercial passenger and cargo planes over more than two decades. The tally doesn’t include every event. Many aren’t disclosed to the media, and reports to the NASA database are voluntary. The Federal Aviation Administration investigates wrong airport landings and many near-landings, but those reports aren’t publicly available. The Marana 757 incident is probably one of those which does not appear in the ASRS database. At the very least, it doesn’t appear under the AVQ identifier for Marana Regional Airport. But if the press had found out about it (which they would have in this age of smartphones if there were passengers on board), I’m sure it would have created the same stir we’ve seen with the other incidents. As a charter pilot, the thing I’m wondering about is whether “commercial aircraft” includes Part 135 flights. Based on the 29,000 figure, I’d assume it does not. Unlike scheduled airlines, charters can and do go to any airport at any time. On larger aircraft, the opspec can literally be global. You’d think this would make a wrong-airport scenario more common, but after years of flying to little corners of the globe, I think this kind of worldwide operation might lower the odds of wrong-airport landing since the destination is frequently unfamiliar and therefore the crew is already on guard. Theoretically we should always fly that way. Unfortunately, human nature can make it tough to sustain that healthy sense of skepticism when a long day concludes at an accustomed airfield. Perhaps recognizing that fact is half the battle. This article first appeared on the AOPA Opinion Leaders blog at http://blog.aopa.org/opinionleaders/2014/02/18/a-true-story-landing-at-the-wrong-airport/. When Wendy soloed the cherokee we both used to own, she did 3 laps with Carter teeters and then he turned her loose for solo. Corona’s airspace (at pattern altitude) fortunately Wendy had the presence of mind to pull an early cross wind to avoid disaster! I have experienced too many traffic pattern incursions and find this problem to be endemic. to 2000 or so rather than enter or fly nearby to a traffic pattern at the same altitude. Definitely a bad move by the Collings folks. Wendy did a good job. Formations are less maneuverable than single ships, but unless there’s some sort of emergency in progress, I can’t think of any good reason to fly through an airport’s traffic pattern like that. I wonder if they wanted to stay low in order to drum up business for the rides they give on those aircraft. Or perhaps they thought the lower fly-by was simply a thrill that people at Corona would appreciate? I’ve seen transients fly through Corona at pattern altitude as well. I have no idea why they do it at 1,500 feet. The Ontario airspace doesn’t begin until 2,700; there’s plenty of vertical space available even when not communicating with Socal. And with the high terrain to the south and northwest of the field, 1500 MSL is pretty low to the ground. Just a thought, maybe the pilots of the retiring Mexican plane knew to look for a cluster of planes to determine the right airport and thought they had it because an airport with a show going on and lots of visiting aircraft could look like a boneyard from afar. Thanks for doing some research on this one! Interesting article. Glad you found it interesting. I never considered the impact a ramp full of aerobatic aircraft might’ve had in their fixation on the wrong airport, but perhaps you’re onto something there. Just goes to show you, even the pros sometimes get lost when they’re navigating visually!